Our Favorite St. Patrick's Day Spots in the Lehigh Valley | 24/7 Emergency Locksmith Inc.
St. Patrick’s Day is Saturday, March 17, and there aren’t many better places to celebrate than the Lehigh Valley. From authentic Irish bars and restaurants, to the best parades around, here is a quick look at our favorite places to be in 2018. There probably isn’t a better bar to spend your St. Patrick’s Day Saturday in Allentown than Callaghan’s! After the Sunday, March 18 Allentown St. Patrick’s Day Parade, Callaghan’s will have $3 16-ounce bottles of Miller Lite, Budweiser and Bud Light and $4 Guinness. A specialty menu will feature Irish staples like corned beef and cabbage. 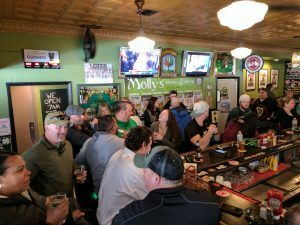 Molly’s may be the epicenter of all Irish happenings in the Lehigh Valley this weekend. It’s a post Bethlehem Parade (we’ll get to that in a minute) spot and will have Irish dancers and bagpipers on Saturday as well! Porters’ Pub is opening up at 9 a.m. on Saturday for the first time since it was established in the early 1990s! Look for possibly the most authentic Irish menu in the Lehigh Valley. Bethlehem’s normal St. Patrick’s Day Parade was unfortunately cancelled, but there will be a brand new one starting at 1 p.m. on Saturday! There aren’t many St. Patrick’s Day parades in the country that can hold a candle to Allentown’s classic. If you want to see how it’s truly done, be there! No matter where you celebrate St. Patrick’s Day this weekend, please be sure to drive carefully and have a DD or use Uber or Lyft! As always, 24/7 Emergency Locksmith will be there for you if you need us! Call us at CALL US: (484) 891-1922 for 24/7 EMERGENCY SERVICE!